Spotlighting four of 2018’s most essential new films, the autumn issue of Dazed celebrates the new stars of outsider cinema – the misfits you can’t take your eyes off, whose path is proudly their own. 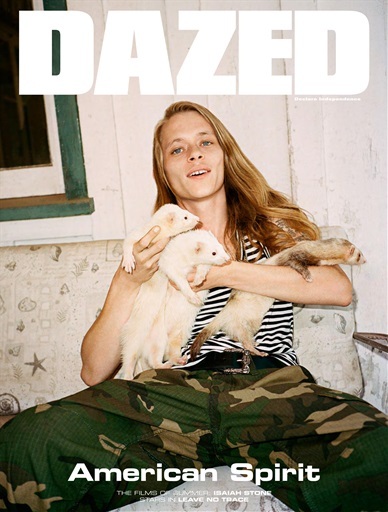 Heading up two of our five covers, Leave No Trace’s Isaiah Stone is captured by Ben Toms in a shoot reflecting his rise as a star of the new Hollywood realism. Also fronting the issue, Jaden Smith trips out in front of Roe Ethridge’s lens alongside the all-female cast of Skate Kitchen; Jack Kilmer channels his Lords of Chaos role as a doomed metal-head in a dark shoot by Casper Sejersen; and Helena Howard reveals the strange magic that made her the beguiling lead in Madeline’s Madeline in a shoot by Brianna Capozzi. Dapper Dan: From a life on the hustle in Harlem to his debut collection with Gucci, the gangster style icon reveals why he’ll always have an ear to the streets.